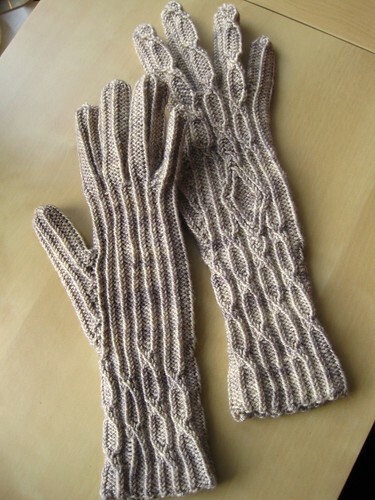 I tell you, I was just going to do “a nice little glove pattern” for Tanis. Just something that would use a single skein of her DK weight. Famous last words, right? Well, it does only take a single skein of the Yellow Label DK, but it is certainly one or two steps up from simple. It took me a few months to really nail this down, partly because I had thought at first this was going to be a colour-work pattern. As it turned out, once my brain switched to twisted cables, all I needed was a sketch and a bit of Art Nouveau and Art Deco inspiration, and I was off and running. The pattern is fully charted from cuff all the way through the hand, and is worked in the round. The most challenging part for most people is likely going to be the fingers (I try to walk you through this in the pattern instructions as much as possible though – I’m here for you), as glove fingers can be a bit fiddly at the best of times when you’re not also trying to continue a twisted stitch motif from the hands all the way through to the fingertips. 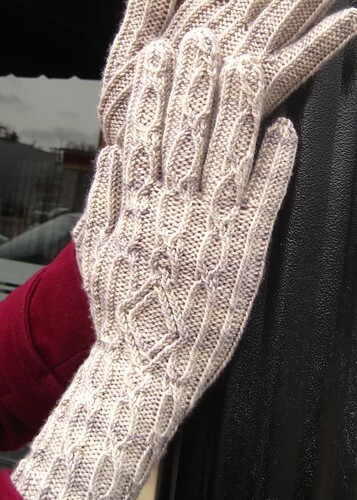 The pattern instructions are worked at a gauge of 26 sts/4 inches over 3.25mm needles, decreasing one needle size at the cuff. I am confident that this provides a good fit for most women’s hands, from about 7.0-8.5 inches in circumference. For a more snug fit, decrease all needles by one size. For a larger/looser fit, increase by one size. I’m glad these babies are out in the world now. If you knit them I hope you will enjoy the process and the result! And as always, please contact me (crazy.knitting.lady[at]gmail.com) if you have pattern-related questions that I can help with. What a perfect pairing of wool and yet also spring! 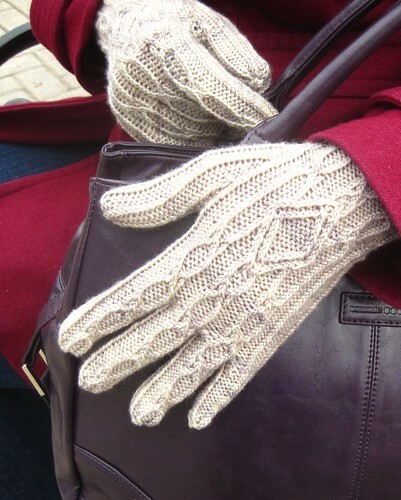 I love lighter weight gloves as distinct from those more suited to winter and these are so ladylike – another quality I particularly associate with springtime! Beautiful! I’ll look for them at the Frolic for sure! I’m almost certain I wouldn’t have the patience to knit these (says the girl who basically only knits sweaters), but they are SO PRETTY. Of course I love them! I can’t wait to get my hands in them, they look so comfortable and somehow also comforting. Awesome. wow, they are gorgeous! And they look so intricate. 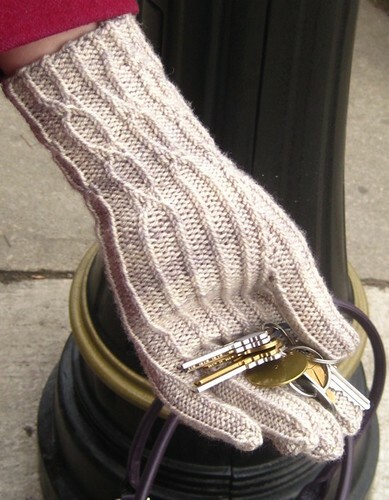 that twisted stitch travelling all over the gloves is really incredible. Beautiful! These fulfill my Victorian (er, Edwardian?) fantasies. Those are very, very beautiful. The cuff looks long off the hand, but on, they are the perfect length. And I can see why you’d adjust size by gauge! I have to figure out what DK weight is tho..is a single skein 50 grams? Gorgeous! As always I am amazed and awed at your creative genius! I especially like the length of your gloves and the “complicated simplicity” of the look. That is, if complicated simplicity is possible. Oh wow! They look absolutely marvelous. I love everything about them. These are STUNNING! I love the staggered cables, so beautiful! Beautiful – I love the pairing of semi-solid with the twisted stitches. Enough variation in the yarn that it actually enhances the involved pattern, rather than detracts from it as a varigated would do, and the tonal variations add depth to it whereas a commercial solid might otherwise appear a touch ‘flat.’ Working with Tanis has really been great for both of you – I didn’t discover Tanis’s yarns until after you first started posting about patterns you had done with TFA yarns. Great job! How did the two of you start collaborating on projects?